Your wedding day is a special day for you and the love of your life. There are many ways to make the day even more personal and special. Writing your own vows is one way to make sure that this day is as romantic and has as much meaning as possible. Writing your own vows is not for everyone, and it is not a task that everyone is comfortable with. 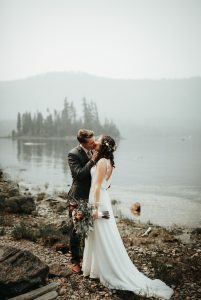 But if you want to give your wedding day an extra personal touch and start your marriage out with an spark of love, writing your own vows is a great way to accomplish this. At Bohemia River Overlook, we love weddings. With three different venues locations to choose from on our property, you will likely find just what you need to make your wedding just want you imagined. We want to help you make your wedding day as flawless as possible. That is why we are offering you tips to writing your vows! In our last blog, we talked about the reasons why you should write your own vows. Some of the reasons we gave on why you should write your own vows included how it makes them more personal, special, romantic, and that doing so can help strengthen your bond. But today we are not talking about why you should write your own vows, today we are talking about how to write them. Writing your own vows can be stressful and nerve-wracking, especially for those who are not creative, don’t know how to get their point across, or those who are too critical of their own work. But everyone can write their own vows, it just may take longer for some than others. In this blog, we are going to give you different tips on how to get started writing the best vows. If you are trying to write your own vows and need help, read on. We can help you master your vows, making them special and personal. Discussing the tone of the vows with your fiance before the wedding can help make writing them easier. Are you trying to make them cry or laugh? Are you telling a story about your love or making them more traditional and stating your promises for one another? Once you decide on a tone and format for your vows, it will be easier to get started and you won’t have to worry about your fiance making their vows funny while yours will bring the tears. Are you going to read them to each other before the wedding day or keep them a secret until then? While it may seem weird to share them before the wedding day, some couples may choose to do this because of the fact that they want them to be more personal and share them with each other before everyone else gets to hear them. Couples can decide if they want the first time they hear each others vows to be at the wedding or by themselves. This is another important decision to make before you start writing. If you don’t know where to start, write down notes about your relationship. When did your relationship start? How did you guys meet? When did you start dating? When did you take the big steps? Where you waiting for a proposal? What were some of the best memories? What is something special about your relationship? These little things can help you come up with the foundation for your vows and allow you to figure out what you want to talk about. Make a list of everything you know about your relationship and what really mattered to you. Think about the little things that meant so much to your relationship and add those into your vows. Take a look at examples of vows, listen to love songs, read poetry, and get inspired in other ways. These can help you get in the lovey-dovey spirit and truly write from the heart. You can even get more personal with the inspiration and look at old pictures of the two of you, read old love letters, and remember how you fell in love. This is a great way to get your head in the love story and vow writing thought process. Remember, vows are promises, so make sure you include a few promises in there, and really mean them. Do you promise to rub his feet after a long day at work? Do you promise to make her breakfast in bed once a week? Stick these in your vows and make sure you will actually do them! Once you have your inspiration and have thought about how your love has grown, there is nothing left to do but write! Of course, there are step to take after writing it, but you have to have a first draft before you can get to the final draft. So, start writing your vows and try to imagine reading them out loud on your wedding day, that should help you know what to include and what not to. In our next blog, we will discuss the steps after you write your vows. But for now, just start with this! You will be able to get started and create something that might actually work! At Bohemia River Overlook, we want your wedding to be as perfect as you do! We can help make your wedding flawless with our different locations and our love for weddings! Contact us today for a tour!